The Denver Opportunity Youth Initiative is a unique opportunity for Rose Community Foundation to make big changes for young people in the Greater Denver area who are out of work and not attending school. These youth are known as “Opportunity Youth.” In May of 2013, the Foundation was awarded a one-year development grant from the Aspen Institute’s Opportunity Youth Incentive Fund (OYIF) initiative. This grant funded the creation of a strategy to ensure that these youth have access to meaningful pathways for re-engaging with work and/or school. The end goal was that these youth be able to earn a livable wage and participate in the civic life of their communities. After the year of strategy work with the committee, Rose Community Foundation received a three-year implementation grant. Senior Program Officers Elsa Holguín and Janet Lopez saw potential and worked to cultivate this project from its inception, building a collaborative comprised of local foundations, public agencies, Denver Public Schools and K-12 and postsecondary experts – all with a portfolio of meaningful work associated with opportunity youth. “While we had the ability to help incubate this project, we knew that an organization with connections to the workforce was the best fit to connect these young people to jobs in the future. For that reason, we began the conversation with the Denver Metro Chamber about their interest in taking on this initiative. Their business membership agreed that this was a strong fit for the Chamber’s priorities,” says Lopez. 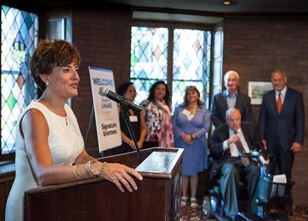 On July 6, the Denver Metro Chamber’s OYIF leadership team including Holguín and Lopez were honored for their work at the Denver Post’s Season to Share event, where the McCormick Foundation Fund, distributed nearly $2.3 million in grants to 49 local nonprofit organizations. Denver Metro Chamber Foundation was awarded one of four brand new system-level grants of $100,000 for their adoption of Denver Opportunity Youth Initiative. Organizations were chosen based on the criteria that they provided life-changing programs in child and youth education, health and wellness, homelessness, and hunger and will help low-income children, families and adults move out of poverty toward stabilization and self-sufficiency. The McCormick Foundation grant will ensure that the initiative, which started at Rose Community Foundation, will grow and be sustained at its new home at the Denver Metro Chamber. It will also help ensure that young people throughout the city will be re-engaged in education and hired as productive members of the workforce.